Sherlock Holmes: What was crime-fighting actually like in the London of his day? What was crime-fighting actually like in Sherlock Holmes-era London? 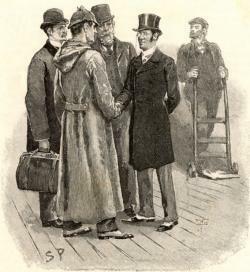 Rendering depicting characters in story “The Adventure of Silver Blaze” from Sir Arthur Conan Doyle’s Sherlock Holmes series. Click here to read June Thomas on the charms of Steven Moffat’s Sherlock. With the second season of Sherlock debuting this Sunday on PBS, here’s an old-fashioned Edwardian mystery to warm up with: You are a police detective sent to the lair of “Kemmy” Grizzard, a notorious London jewel fence. He is known to have a stolen diamond necklace for sale on the premises. Inside, you find Kemmy and three likely buyers calmly sitting down in the dining room to a soup course. There is nothing incriminating in their pockets, and upon informing Kemmy that you will search the home from top to bottom, his response is ingratiatingly polite: Gentlemen, search wherever you like. It’s a lapse worthy of Sherlock Holmes’ hapless Scotland Yard foil, the dogged but unimaginative Inspector Lestrade. But unlike Holmes or Lestrade, Kemmy Grizzard was real—and his home at 73 Parkholme Road still stands today. The story comes from George Cornish’s memoir Cornish of Scotland Yard (1935), which is part of a genre of long-forgotten Yard tell-alls that flourished as a group of old-timers retired in the 1930s. They offer a fascinating, almost wistful glimpse into a gaslit era of crime—the real-life London most of us only know from the fictional tales of Sherlock Holmes and Dr. Watson. Leeson had joined the force just as the Jack the Ripper murders were terrifying London, and the Ripper haunts Scotland Yard memoirs. Frederick Porter Wensley joined the force around the same time Lesson did, and in Forty Years in Scotland Yard (1931), he recalls these first weeks on the job, as hundreds of police scoured the streets of the Whitechapel slums without result. Wensley and others took to nailing pieces of old rubber bicycle tires to the soles of their regulation boots, the better to quietly pad up behind the Ripper while in the act. One newly hired officer, P.C. Ernest Thompson, may have succeeded all too well when he spotted a suspicious character in Swallow Gardens. “He is believed to be the only constable who ever saw Jack the Ripper,” records Chief Inspector Tom Divall in Scoundrels and Scallywags (And Some Honest Men) (1929). “He ran after him, but fell over something on the ground; turning his bull’s eye lamp on to see what it was, he was shocked to find the mutilated body of a female.” This was Frances Coles, who was still alive, barely, but unable to speak. Thompson was left badly shaken. “When he came to himself again,” Divall writes, “he told those around him that he was sure he would never die a natural death.” Thompson was correct: He was later fatally stabbed in the line of duty. Even without the Ripper, Whitechapel’s legendary reputation for crime was richly deserved. Chief Inspector Divall recalls characters like Peggy Donovan, an improbable ruffian who robbed the unsuspecting by unscrewing his wooden leg and using it to club his victims over the head. Other criminals had a lighter touch: One gang, called the Stickers, was known for filching coins from bar tills by using walking sticks covered with adhesive. In short, police had many of the same tools as Sherlock Holmes, if not his brilliance. This state of affairs hints at one reason why Doyle’s stories still fascinate us. They conjure up a London when one can imagine an amateur detective armed only with a keen mind and a magnifying glass solving the crime. By the 1930s, detection was truly a team effort, increasingly backed by careful recordkeeping and laboratory work—and now, the old Yarders complained, it was crime itself that seemed to have become the pursuit of amateurs. As for our notorious jewel crook Kemmy Grizzard, though, the Yard eventually got their man: They nabbed Kemmy in 1913 with the “Mayer Necklace,” a string of pearls then valued by Lloyds at £150,000. Not even the thickest pea-soup, it seems, could hide a crime like that.